The Rowes Wharf Sea Grille is perfectly situated where land meets sea at the most picturesque spot along the Boston waterfront. Chef Daniel Bruce's vision for the restaurant celebrates the sea - inventive seafood dishes are artfully presented, and the design of the contemporary space mirrors the ocean beyond the windows. Heralded as a chef with a delicate hand when creating seafood cuisine, Daniel's menu showcases his talent and technique. There are traditional favorites and adventurous offerings. 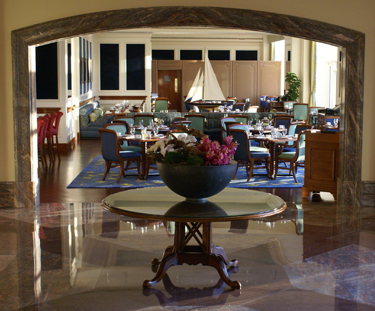 The Rowes Wharf Sea Grille is an ocean oasis nestled on the city's shore.